One of the many benefits of living in a neighborhood is getting to meet and know your neighbors. I was fortunate this week to run into our neighbor who lives directly next door. She is a lovely lady perhaps in her 70’s or 80’s whose son also lives just three houses down from her. He comes by and helps her out from time to time with the household chores including yard work. Yard work was what brought us together this particular afternoon. The sun was out and the weather good for gardening; not too cold, nor too hot. It was mid October the perfect time to get the yard ready for winter. My neighbor, whom I’ll call Mary, came right over for a nice little chat when she saw me come around the corner into the side yard between our homes. I was dressed in my gardening attire: grubby pants, long sleeve shirt, gloves on, clippers in hand. She was sitting at her breakfast table, sipping on something, when our eyes met. Mary stood up, made a motion with her hands that she was coming out to greet me. We stood there on the lawn, and got to know one another. Mary has lived in her home for over 50 years. She knew the original owners of the home I’m living in, AND knew about what was planted where and why. This information I found helpful, because there were a few odd looking bushes that I honestly couldn’t identify. In addition to her extensive memory regarding the plants in my yard, she also had a strong opinion about the person who planted them, the former owner whom I will call Nancy. Then we came around to the enormous evergreen that consumes a fourth of my back yard. At one time perhaps it was an accent shrub that helped balance the yard between the rhododendrons to the left and the shed on the right. It is the oldest and largest shrub I have ever seen. It is hard to identify in its colossal form, perhaps a juniper, which typically grow 6 feet max. 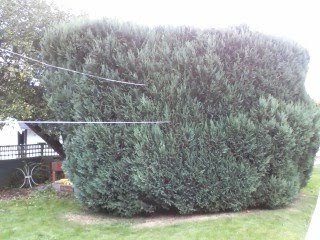 This bush however is over 15 feet high and over twenty feet in diameter. The trunk is 4 feet wide with many arms branching off of it, making a nice fort for my nephews. You get the sense that it’s the dinosaur of shrubs when next to it. As if staring into the back side you may find a portal through time. I WAS asking and I agreed. A tree doctor needs to get in there. The branches towards the bottom are so heavy they are growing into the ground and rotting! The large evergreen grew to be wider than the shed, which doubles as a one-car garage, it stood in front of. When looking out the back porch window, the shed cannot be seen due to this mutant sized evergreen. But her comment got me thinking. We all value our privacy, and need buffers physical or not between relationships. When we go to the bank, we do business behind a counter. At work we may have a desk or a table between us and our co-workers or customers. In a taxi cab Plexiglas separates the two parties of driver and passenger. We need buffers, hedges when we interact with others. It seems to be a part of our society that is a comfort. If there are no buffers during a transaction, just a hand shake for example, we may feel like we participated in something unofficial or illegal. Mary couldn’t see the benefit of the shrub, but Nancy and her sisters could. The overgrown mammoth stood guard and kept them safer in a world of unknown dangers. And besides… whose yard was it anyways?